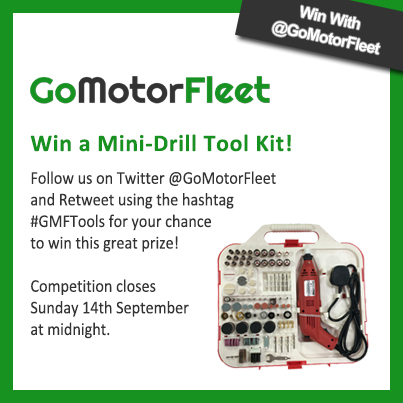 Enter GoMotorFleet’s Competition to win a Tool Kit! Home Blog Enter QuoteSearcher’s Competition to win a Tool Kit! Enter QuoteSearcher’s Competition to win a Tool Kit! As a fleet manager you will spend most of your time looking after a range of vehicles which often means working long hours. Keeping things organised and well maintained at home can therefore sometimes slip your mind, even though you probably have some great DIY skills! This is why in this month’s competition QuoteSearcher is giving away a 162 piece Mini Drill Tool Kit that will help you with any DIY jobs, big or small. For your chance to win this great prize all you have to do is Follow us on Twitter @QuoteSearcher and Retweet using the hashtag #GMFTools. Competition closes Sunday 14th September at midnight. Good luck! Entrants must be 18 years or older and based in the UK. Winner will be chosen at random and announced on Twitter once all the entries have been counted. Prize must be claimed within 7 days or the winner will be redrawn. If original prize is not available then another of the same or equal value will be provided. There are many ways you can make your motor fleet better for the environment without getting rid of your petrol cars in favour of electric vehicles. Learn how to start the process to a more eco-friendly fleet in our blog. Do I Need Liability Insurance for My Startup?